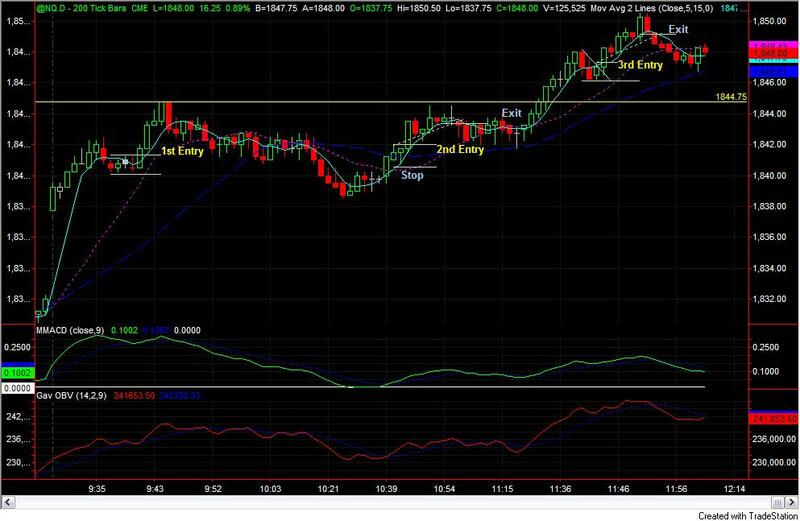 I have made 3 long trades on NQ futures today, one during opening, 2 trades around noon time. Tough all trades were profitable with very small trades, I don’t feel I was making good trade. I failed to hold on winner which would definitely give me bigger profit. End the day with +2.23 R gain. I saw a dummy setup right before I shut down my Tradestation. This is a small R trade. 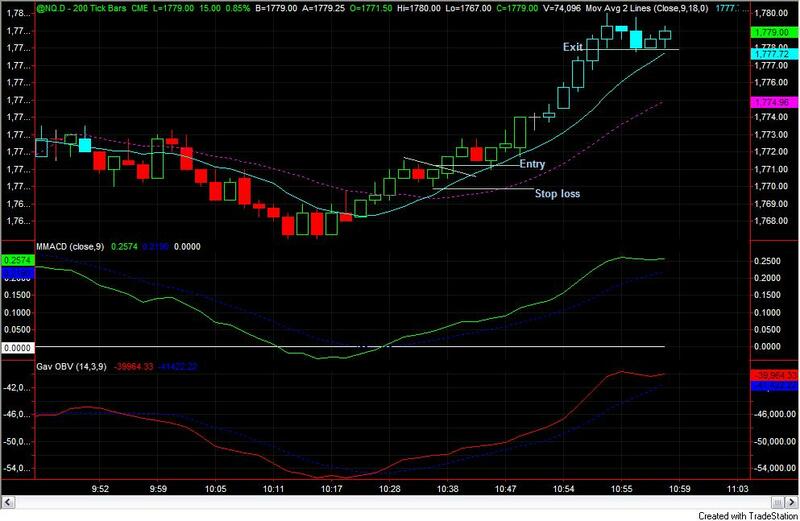 Long position of NQ futures was established around 1205pm. NQ was moving in my favour, however, it was slow. And subsequently, an ugly big down candle at 1230pm pissed me off. I bailed out with 0.21 R (after commission) gain. Over the past few months, I have made a number of dummy trades. If you’ve read my blog, you know I have posted all my winning and losing trades here. It is very important to note down your bad trades in your trading journal. However, I think it is good to revisit good trades as well. The more you see/learn positive behaviours, the more likely you will act positively. So by reading more good setups and good trades, I hope it will improve my “chart eyes”. 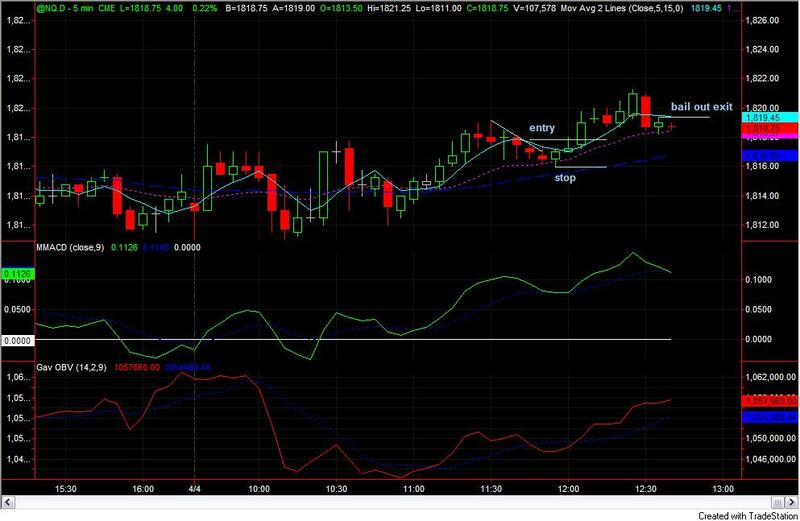 I have chosen some trades that I feel I did well in term of setup, execution, return and ,of course, when market condition was good enough for dummy trades. 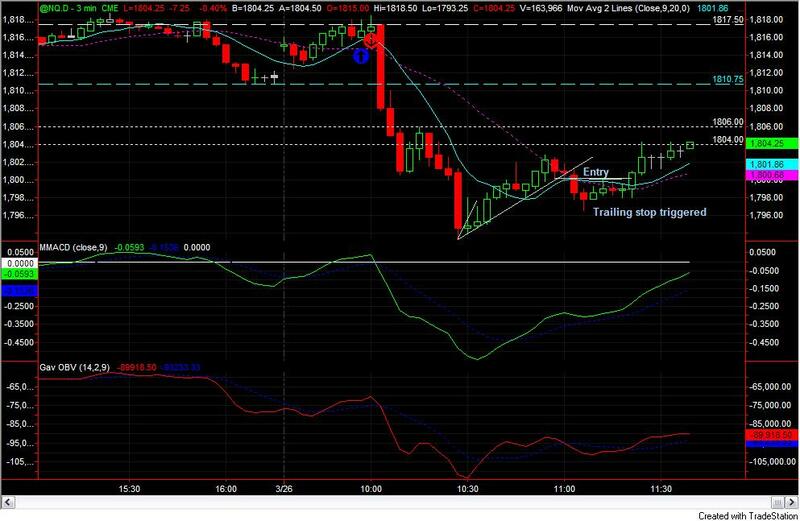 Still, there are mistakes in them..
Short position of NQ was established around 11am. Trade did go in my favour, however, it was slow. I trailed stops and get stopped with -0.27 R loss. Journal note: This is a bad trade. Firstly, It was too late for short entry. And subsequently, a long setup was formed and it was not taken. There is a need to establish a method to identify a new setup when one setup failed. Be flexible, I need to learn. The first trade of the week is a -R loss. I got in long position of NQ a couple of minute before 10am (right before home sales report released). Am I right or wrong for the timing? I don’t know, but I don’t trade on news, anyway. I am not going to post the chart this trade. Messy chart. One trade closed with -1 R loss. I did make a mistake in this trade. In my premarket analysis journal, I have in fact, determine some levels of entry. And when I saw an opportunity, I totally forgot about these levels. So, I wasted the time and effort of my premarket analysis. DUMB.